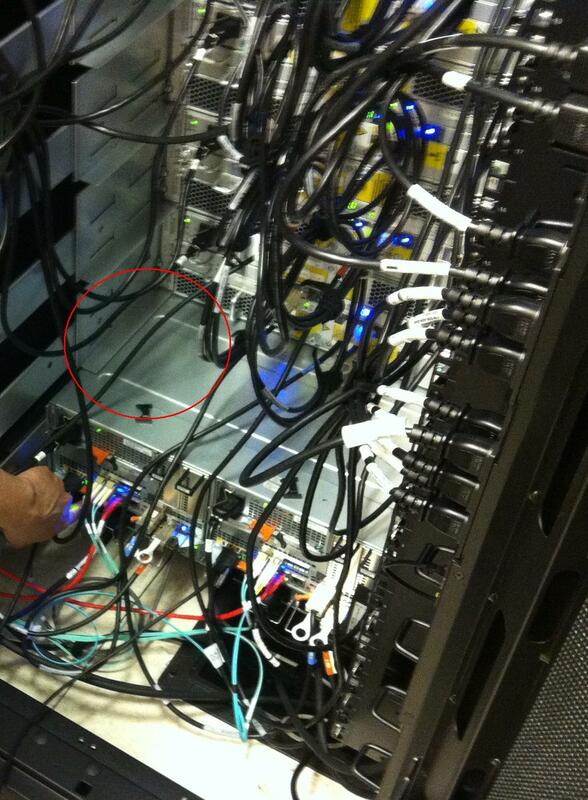 Last week I had the pleasure of being involved in a data in place upgrade of a VNX 5500 that was in desperate need of more capacity and performance. The decision was made to perform a DIP, so this is in fact an easy procedure: replace the Storage Processors and you’re good to go? Well, almost. Are there currently any open Service Requests for failed drives for example? Does USM give any blocking warnings? Well, the system only had a single HBA connectivity issue on some unimportant server, so we were good to go. We disabled the schedule for some incoming SAN Copy sessions and manually fractured all mirrorview groups. Using USM we upgraded the Utility Partition and we uploaded the “In Family Conversion Package” to both SPs. During this process we had a laptop connected to each SP using a serial cable and “putty” (with default settings, so 9600,8,N,1) with logging enabled (!!!). Having logging enabled is important, because when problems emerge, these logs are needed by EMC. So now both SPs needed to be rebooted and since the new code was model 5700 specific and the hardware was still a 5500, both SPs halted right after the POST and we could indeed monitor this in our putty tool. After this restart we switched off the SPSs and the VNX 5500 shut down gracefully. Copyright 1985-2010 Phoenix Technologies Ltd. WARNING: POST has been instructed to stop the boot sequence! The red text indicates that everything went well and the operating system indeed detected that the hardware didn’t match the 5700 yet. The last 5 lines indicate the shutting down of the SPSs. 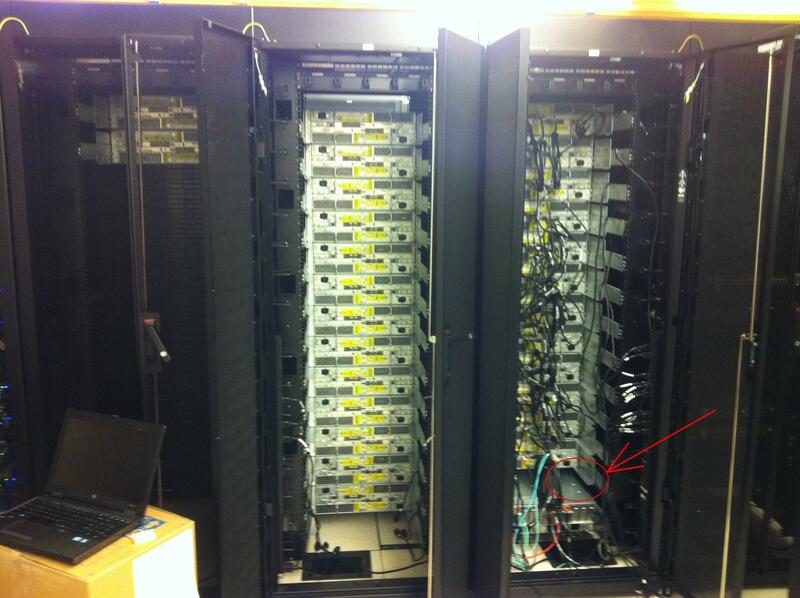 As you can see in the first picture in the (thin) red circle, the old SPs were still in place and the top of the SPs matched the rack space and fitted the space exactly underneath the first DAE (disk array enclosure). Since now the 3U 5500 DPE (disk processor enclosure) will be replaced by a 2U 5700 SPE (storage processor enclosure) and all 15 disks from the DPE would need to be removed from the DPE and placed into the new empty 3U DAE 0_0, we needed 2U extra rack space. The SPSs didn’t have to be replaced, so those will simply be reused. But this leaves us with the fact that we are getting rid of a 3U DPE, but we need to place a 2U SPE as well as a 3U DAE. We decided to move all DAEs to the next position, so we would get a free 3U DAE space where DAE 1_0 used to be. As you can see in the 2nd photo (red circle with arrow)the new SPE is in place as well as the new DAE 0_0, leaving a small 1U gap. But since we weren’t going to need this 1U, this gap will be left there for some extra cooling (actually the SPSs were that heavy that we decided it wouldn’t make sense to move the SPSs and SPE up 1U, so we kept this 1U gap between the SPE and DAE 0_0). DDBS: Disk WWN seeds match each other but not chassis WWN seed. DDBS: **** Flare Partition rebooting after IO Module Powerdown for MiniSetup. DDBS: **** Flare Partition rebooting after finishing MiniSetup. The time stamps mentioned in the log don’t match the actual time that Saturday. It looked as if it started on GMT and ended on CEST, so the actual time was something like 2.5 hours. It needs to be said that the upgrade was a textbook upgrade without any problems whatsoever! We checked the Unisphere warning page and except for the single HBA error of some server that was there when we started, the VNX was once again error free. Since we now got some extra cache we configured the extra cache so no unused RAM was left over. Everything looked very good indeed, all connectivity was restored, we enabled the mirrorview groups as well as the schedule for these SAN Copy sessions. Right after the DIP we upgraded the OE for block from version 32 patch 011 to patch 015 and along the way we noticed that BE 2 and 3 weren’t initialized. The procedure didn’t mention this, so we searched for a solution on this and even started a live chat to speed things up. Since the live chat is actually meant for “break fix” solutions we didn’t get an answer that could help us, but the support person on the other side was doing his best to patch us through to somebody who knew. And then it dawned to me that I remember reading on ECN about a similar issue on a Clariion CX4-960. And unfortunately this day ECN was in an upgrade, so I didn’t have access to this slightly older solution. I was about to make some calls towards people in Ireland when I remember vaguely that enableing extra ports (the VNX 5700 has 2 more BE ports as well as FE ports compared to the 5500) was easily done by using USM. In USM we choose “Add or replace system hardware”, then “Hardware installation” followed by “Install I/O modules and/or SFPs” and the rest was the well known “next, next, finish” and after hald an hour or so all 4 BE ports were up and available for use. Great post and on the job tips! Is this upgrade a procedure in the VNX Procedure generator (didn’t see it) or does one have to pull together a few procedures from? Just wondering is the whole process officially documented. yes, the whole procedure comes from the PG indeed. My post was the output of that PG, including logs and pictures that I took when working on it. So if you follow the Pg you should be ok.
We are just about to do an upgrade for a client. This will be a 5300 unified to 5500 unified. A bit easier since no replacement of disks or DAE’s are needed. I had one question. When you say utility partition upgrade I assume you upgraded the flare code to a 5500 capable flare code? Not sure what is meant by this. first of all my appologies for this late response, but I just returned from a long summer holiday that started on July 20! Oh well. First of all we needed to swap disks from the DPE to a new DAE since a VNX 5700 doesn’t have a DPE, but an SPE and you are staying with a DPE in your 5300/5500 conversion indeed. You only need to swap the SPs, but you also need to prepare the boot partition to accept the fact that from after the hardware upgrade a new SP will boot the code and the process won’t halt. for this you need to upgrade the utility partition. Ok, there’s one more since you can also upgrade firmwares of the disks. The utility is a piece of disk space where – simply said – utilities are stored that EMC engineers can use to access and repair storage arrays, when needed for upgrades, repairs. An end customer doesn’t have to worry about this partition at all. But the upgrade process makes use of this to prepare the boot partition for the new Flare code needed for the new hardware in my case. If you don’t have the procedure handy, don’t start converting the VNX and get that manual first. Your reseller or EMC should be able to get this for you. this blog is really helpful to me. i hope it’s like NetApp’s headswap!!!!! !